We mentioned dendritic spines in connection with the distinction of different types of synapses in the electron microscope (Chap. 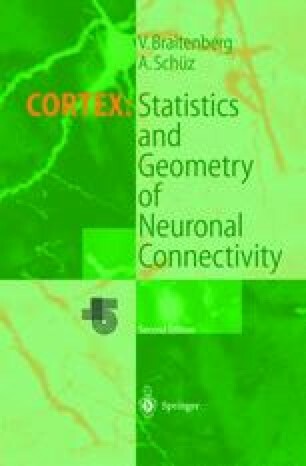 12) and then again in Chapter 15, where they served as one of the main criteria for the definition of different neuronal populations in the cortex. Some neu¬rons have almost as many spines as they have (afferent) synapses, and this seemed important enough to define a special class, that of the pyramidal cells (or spiny neurons, as some would prefer) irrespective of the shape of the dendritic and axonal ramification. Other neurons have no spines, or very few spines; moreover, for these few spines it has never been shown that they are really the same as those of the pyramidal cells, which have a very characteristic appearance on electron micrographs.